Oh Corn! You are so tasty when good, and so bad when not. 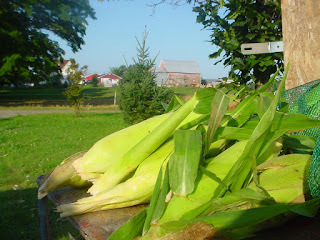 I think it best to avoid any early corn offerings at your local market, and get really tired of broccoli and zucchini and early summer vegetables while you wait for Perfect Corn. Then, right about mid August, when the ears fatten, get yourself a dozen and feast. 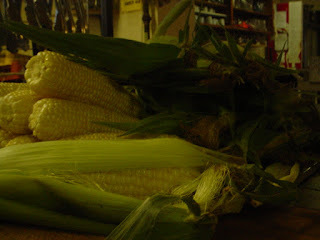 This morning I had the pleasure of helping myself to beautiful corn for only $3 a dozen, at the same honour system stand that had provided me with most of the strawberries I ate this summer. Then I took the corn to the restaurant, shucked it, cut off all the kernels and made a beautiful and simple Corn Chowder, which I served at lunch. Courtney, my trusted salad gal, made Peach, Fresh Tomato and Corn Salad. For a couple of food dorks, this is what it’s all about. 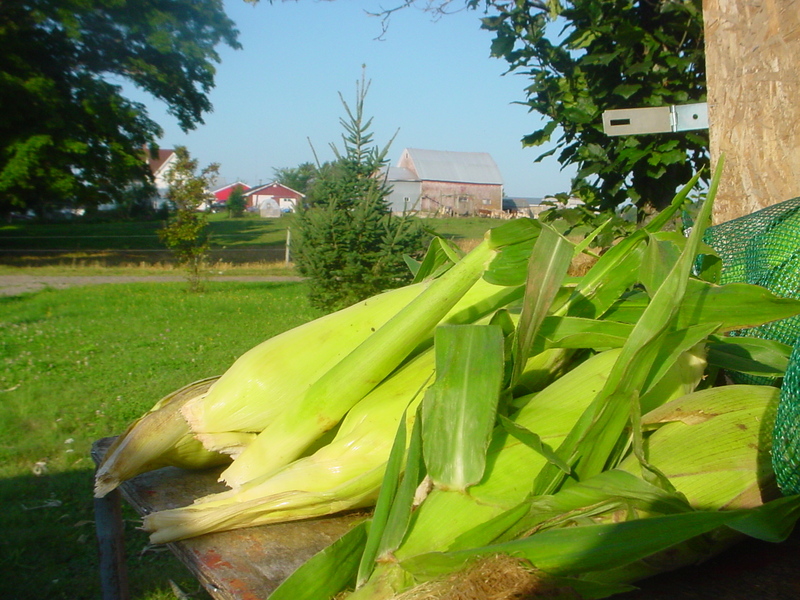 Steaming is the easiest and fastest method of cooking corn, requiring only an inch of water. Shuck and de-silk the corn, pile into a large pot with an inch of water at the bottom and set it over high heat. When steam starts billowing out, set the timer for two minutes, no more. Today’s sweet corn really only needs to be heated through, then it’s ready to eat. Try combining equal parts of butter and maple syrup with a pinch of cayenne or maybe a small spoonful of sriracha sauce, then brushing this on the corn after it’s cooked. If you’re making this with leftover cooked corn, there is no need to fry it. Simply scrape from the cob and combine with the remaining ingredients, including the olive oil. Heat a small frying pan over medium high heat. Swirl in the oil, then add the corn kernels. Cook briefly, a minute at most, until heated through. Scrape into a bowl, making sure to include the oil. Add the remaining ingredients and toss gently. Stand the cob on end on your cutting board, then cut the corn from the cob. Scrape the cob clean with the edge of the knife into a bowl. Place the scraped cobs in a pot and add 16 cups of water. Bring to a boil while you get on with the recipe. Heat the butter in a pan over medium heat and add the onion. Stir and cook for ten minutes or so, until the onion is softened and starting to brown. Add the flour to the onions and butter and cook another minute, then whisk in the cream or milk. Continue cooking, stirring the whole time, until the mixture bubbles and thickens. Turn off the heat. After the cobs have boiled for 20 minutes or so, add the cubed potatoes. Cook for 20 minutes, or until the potatoes are tender. Reduce the heat to low. Pull the cobs out with a pair of tongs and discard, then stir in the onion and milk mixture. Add the corn and parsley to the pot and simmer for another ten minutes, then serve!